Course for the doctoral students. Open for also for MA students. ELO-L0008, (L01) Dialogues with X: Art, Film and Theory Workshop (2 cr). What happens when a philosopher encounters an artwork? During the course Dialogues with X: Art, Film and Theory Workshop (2 cr) we will explore, through in-depth readings of selected texts, what happens at the intersection of a philosophical text and a contemporary artwork. The emphasis is in cinema and media art. How can the materiality of an artwork be translated into the language of philosophy? What happens in that encounter? What is encountered? The course consists of reading selected texts, viewing films and artworks discussed in the reading materials, and lectures offered by visiting experts. How does artistic research – at the intersection of art and theory – relate to the encounters that occur between philosophy and art? 9AM-4PM: Markku Koivusalo: Philosophers’ Encounters with Art. 9AM-10:15 AM: Susanna Helke: Jacques Rancière and Cinematic Ruptures. 10:30AM-4PM: Ivana Momčilović: Jacques Rancière and Modern Times in Cinema. 9AM-12PM Harri Laakso: Jean Louis Schefer and the Body That Is Missing. 1PM-4PM Katja Lautamatti: Giorgio Agamben – For Ethics of Cinema. 9AM-4PM: The students prepare a presentation with a chosen method reflecting the questions of encountering an art work, formulating their own philosophy of art. They can discuss their own artistic work, artistic processes or a chosen art work by someone else, using dialogically philosophical texts. This entry was posted in Seminars on March 14, 2019 by Karl Ketamo. Welcome to a meetup about creative reuse of open heritage materials. Get to know the people behind the OpenGLAM community and Open Knowledge Finland and learn about current projects concerning creative use of archives. The aim of this meetup is to gather Galleries, Libraries, Archives and Museums (GLAMs) and connect them with heritage lovers, students, professionals and creative people, both in and outside Aalto University and the GLAM community. 15:00 Presentation of Open Knowledge Finland and OpenGLAM. 15:20 The making of a massive open online course about Open Digital Cultural Heritage. 15:40 On Returning. The making of a workshop for Post-Digital Archives. 16:00 Visual Resources Centre as a guide on how to find and how to use visual material. – Aalto Archives and mass digitization, 5 million pages and 150 000 images in one year. – OpenGLAM, next steps. Discussions and networking. Robert’s Coffee on the first floor serves coffee and refreshments during the event. The event is open for all! No registration needed. This entry was posted in Event on March 12, 2019 by Karl Ketamo. Welcome everyone to the second Media Lab Doctoral Seminar of the year! The Living Threshold / Altered States. Designing experiences for sustainable audio-visual immersive ecosystems. Augmenting our physical world with digital, immaterial, virtual layers, introduces thresholds between the two dimensions, separating, like portholes an inside and an outside, a “here” and an “elsewhere”. Although never fully crossable or completely permeable, these thresholds still allow for exchanges with the other side, like porous, semi-transparent membranes between real and virtual worlds, gateways between two realities. These thresholds reveal and hide at the same time. Their materiality, their appearance, their affordances shape the kind of experience we undergo when our body interfaces with and extends through such layered realities. Unfortunately, the materiality of these thresholds is often concealed or mystified. The current technologies for interfacing real and virtual environments (often addressed as Mixed or Extended Realities) are driven by commercial preoccupations, being more and more employed in consumer electronic commodities. 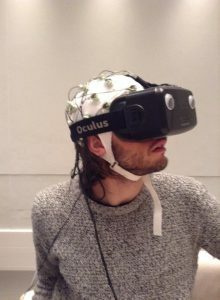 The mainstream approach to XR today is characterised by proprietary technologies exposed to extremely rapid obsolescence, black box tools and by a general ideology of novelty that, on the one hand reinforces waste accumulation and consumeristic drives and on the other makes it harder for artists and practitioners to design experiences outside of those paradigms. In this mainstream scenario technology is designed to disappear, to conceal itself, and the experiences it channels are conceived like visual illusions, where simulation and plausibility are the key ideas, in a well established traditions of cinema and video games. My research, reflecting on the idea of threshold, its materiality, its behaviour, its autonomy, proposes an alternative direction to investigate the design of audio-visual immersive experiences, facing the technical challenges from a DIY, alternative, low-impact perspective. The initial step of this process has been the immersive installation Blindphones, developed in the frame of the joint program Futurelab Academy between the Department of Media, MediaLab and the festival Ars Electronica, Linz. The idea behind this installation was to re-appropriate some of the key concepts behind VR, such as re-embodiment and immersion, but, abandoning any commercial device and proprietary technology, attempted to reimagine the head mounted display as a form of an almost alien living prosthetics, radically changing our perception providing a glimpse of an alternative embodiment. Rather than as a tool to fool our senses by providing (some of) them with a credible simulation of the world, conforming the viewer into a normative embodiment, Blindphones, by heavily impairing sight, forces the body to function using hearing, rather than sight, to articulate sense in a dreamy world made of shifting lights and sound. Inspired by the altered states induced in the sensory deprivation tank, where the body floats weightlessly in a dark quiet environment and the mind shifts from a meditative state up to an hallucinatory one, the project draws from the psychedelic tradition of early VR art and drone music. My PhD is made up of two equal parts that inform each other: a monograph and an artistic project. The aim of my monograph is to give audio-visual artists a theoretical and practical basis for using new media technology to tell their stories, while also giving insight into the current context that these media are embedded in. My artistic project (“Ego Cure”, a cinematic VR experience with enactive elements) is set in a world where the perception of art as a product has come to its logical technological conclusion: the Ego Cure mask is a technical tool that helps artists who get stuck (for example writers block), to continue with their practice. This has been used to make art more of a commodity, by forcing an artist who is unable or unwilling to provide a commissioned art piece to use the mask. The plot of the film follows Emma, a choreographer who decides to redo her entire performance a day before the premiere which meets the resistance of the curator. At the turning point of the story the protagonist is forced to use the EgoCure mask, and we are thrown with her into a world that both literally and conceptually rips open the fourth wall and teases the possibility space of storytelling in Virtual Reality. The physical experience of the viewer becomes intermeshed with film itself, when Ego Cure introduces enactive elements that support both the theme and the flow of the plot – by making use of the liminal space between immersion and self-awareness. During the making of my artistic PhD we developed a workflow for creating VR experiences that are sustainable, while reframing existing aesthetics and cinematic conventions to this new medium. We used current digital cinema cameras and compositing software, which allowed us to adopt conventional working methods, team structures, tools, workflows and aesthetics. If you compare novels and cinema there are certain experiences you can explore in one medium that are impossible in the other. Over the last 120 years cinema kept evolving visual storytelling for example, as a tool that engages both our perception and our imagination. Since Cinematic Virtual Reality (CVR) is a very young art form it is lacking its own set of storytelling tools. My work provides concepts and a proof of concept (artistic project) which can help artists explore the narrative potential of this new medium and engage their audiences’ imagination.